We are a team of skilled and dedicated realtors who not only sees but also promotes a life with both comfort and style. Style doesn’t mean luxurious decoration in a million dollar mansion. Style is What Makes You Stand Out of The Crowd. It is natural for one to be attracted to nicely appealing objects around us. When it comes to buying/selling a house, a nicely presented one will most likely get more attraction, would you agree? We have helped clients with “styling up” properties. Either it”s a staging job for a listing property, or providing consultation on re-modelling a house, artistic style does not need to compromise with comfort. You surely can have both! Taking advantage of our artistic vision, we create a specific staging and marketing package for each listing, depending on the needs of the client and the house. Our main goal is for buyers to be attracted to a home by making it look warm and inviting, yet generic enough that buyers can picture themselves living there. Not every Real Estate agent is the same. You need a smart, savvy person to sell that home quickly, and for top dollar. We have a highly effective marketing and presenting system that will bring more buyers for your house and create an auction-like atmosphere that drives up the price of your house. Because every house is different, every area is different, we will tailor make a detailed, comprehensive, attractive marketing package to your house; provide you professional suggestions and advices; construct and execute an effective marketing plan until your house is sold; work to a satisfying closing for you. 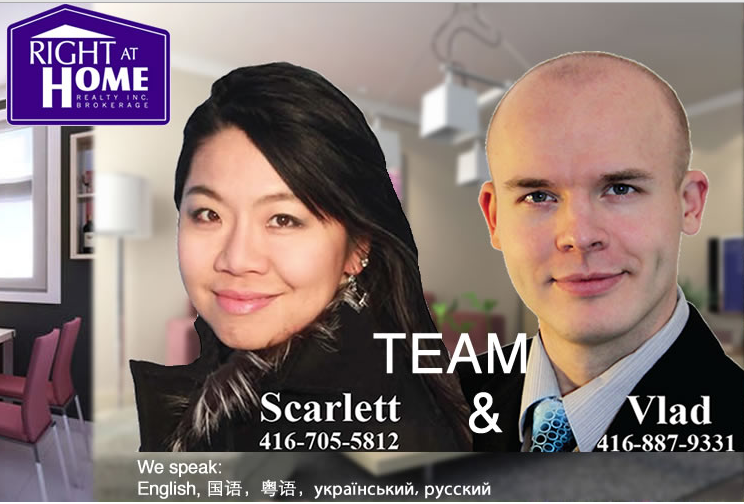 Scarlett is the owner and founder of multimedia design firm Kacci Design Studio, whereas Vlad is the creative director. 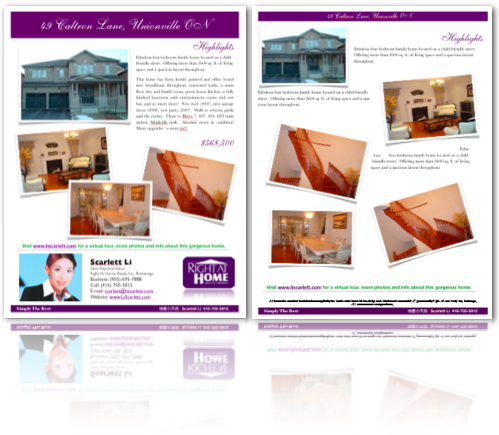 For every client, every listing property, We assign designer to create high-quality advertising materials such as feature sheets and multimedia virtual tour. All these are already included in her service package at time you hire Scarlett as your Realtor. We are professional and dedicated, we are also excellent negotiators. We do everything to our hearts to ensure it”s done to the best possible level. What matters to you, it matters to us. And More Importantly — Scarlett Cares What You and Your Family Needs and Wants! We care what you and your family loved ones need or want in the whole buying/selling and moving process. We listen and observe carefully to understand what your family needs, provides you most practical and effective suggestions and advices, work closely with you and for you to get things done. We work to your complete satisfaction! You have two dedicated professionals work solely and fully for you at the same time but only paying one! Our promise to you: We will work the hardest to get you the BEST result! We are expertised in leveraging internet powerful networking and promotional tools to maximize every listing’s exposure which directs to a powerful sale. No Obligation, No Pressure, Free Evaluation!